That’s the gist of an email message sent today by Leadnow.ca to its estimated 400,000 followers across Canada. Leadnow asks you to share this message — or just the graphic — via Facebook, Twitter, and I’ll suggest email, and blogs. Last week’s worst-kept secret is out. This morning, Stephen Harper went to the Governor General and triggered the election over a month early – setting us up for the longest campaign in almost a century, and the most expensive Canadian election ever. He’s exploiting a loophole he buried in last year’s voter suppressing “Fair Elections Act,” and is trying to win by massively outspending the other parties. Harper is starting the election over the August long weekend because he hopes voters will be distracted. 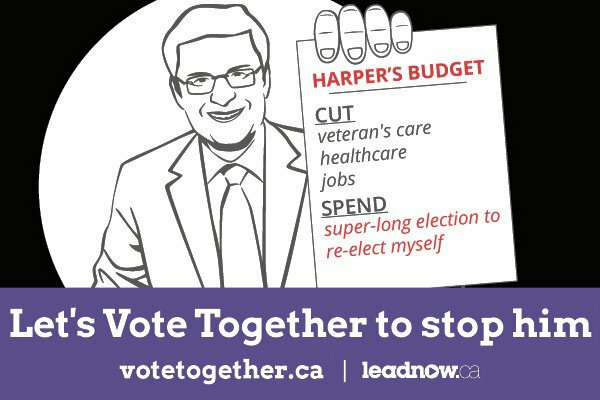 Can you share the image below to make sure people across Canada remember Harper’s priorities? When thousands of us amplify powerful images, we can expose exactly what politicians are trying to sweep under the rug. Federal Election 2015: Tory MPs, Ministers Pledge New Cash, Recycle Old Promises by The Canadian Press, Huffington Post, July 31, 2015 — Federal cabinet ministers have made almost $1.6 billion in spending promises in the last two days, as the hours tick down to an expected election call. 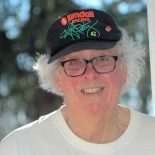 This entry was posted on August 2, 2015 by fjwhite in information counterpower, moral & ethical counterpower, NGO counterpower, political action and tagged Canadian election 2015, leadnow.ca, Stephen Harper.